A large majority of pets older than three years of age have periodontal disease. Periodontal disease stems from a proliferation of bacteria that can destroy a pet’s teeth and gums, making it hard for him or her to eat or drink because the condition is so painful. If left unchecked, these bacteria can even damage a pet’s heart, lungs, liver, and kidneys. The AAHA recommends that pets have their teeth cleaned by a veterinarian annually, and that pet owners follow a daily pet dental care regimen at home. Beattie Animal Hospital not only provides advanced pet dentistry evaluations and cleanings, we can even show pet owners in the Brantford area how to take care of their pets’ teeth at home too. Our 24-hour vet team can help busy pet owners make sure their pets get the pet dentistry care they need. Our veterinarian will thoroughly examine each pet’s teeth, followed by a complete cleaning above and below the gum line to remove plaque. We can also do extractions and other oral surgery if necessary. We also polish the pet’s teeth so that bacteria have less of a foothold in the future. All pets are carefully screened and tested before any veterinary dental procedure that requires anesthesia. After our veterinarian cleans and assesses the health of your pet’s teeth, our veterinary team can provide tips to pet owners to keep their pets on a regular dental routine. 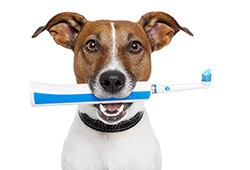 Although this may seem daunting at first, brushing a pet’s teeth is just as essential for his or her health as it is for their human family members. Bacteria, saliva and food particles build a layer of plaque on teeth every day. This can be brushed off, but if left alone for days, weeks, months or years at a time, the plaque becomes tartar that harbors these damaging bacteria and cannot be removed without a professional cleaning at the animal hospital. Our veterinarian recommends introducing pets to a dental regimen at the same time every day, along with lots of praise and patience. Start by dipping a finger in some broth the pet enjoys, and then let him or her lick the finger, eventually moving on to rubbing the pet’s teeth and gums with it. Then, introduce the special pet toothpaste in the same manner. We strongly urge pet owners who have never brushed their pets’ teeth to call our animal hospital to schedule an appointment before trying to brush their pets’ teeth. This will allow us to assess the health of the teeth first and give instructions for at-home care. Eventually this can become a bonding habit between pets and their families, all while keeping the pet’s teeth healthy. Call our vet at 519-756-1770 for a veterinary dental appointment today!